Deli ponies arre native to the island of Sumatra in Indonesia. 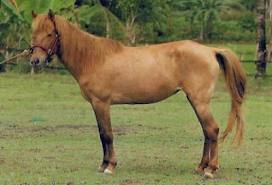 They are closely related to Batak Ponies -both were developed in the Batak hills. They are most likely named from the large numbers of ponies exported from the port of Deli. They were first exported to Singapore, Malacca, and Penang, and from there spread they out across Malaysia. It is believed that the first horses in the Malay Archipelago arrived several hundred years ago, either by Hindu invaders from the west or merchants from Pegu and China. It is very probable that the Shan Ponies, native to Burma and bred by its hill tribes, were imported to the highlands of Northern Sumatra where there was open country. From there, these horses were crossbred with Arabian stallions brought in by the Arab merchants sometime around 1375. Deli ponies have an attractive head, well-shaped, and high-crested necks due to a strong infusion of Arabian blood. They are very small (averaging only about 11.3 hands) although some reach up to 12.2 hands. Their most common color is seal brown, though skewbalds also can be found. Deli ponies are one of eight breeds native to Indonesia, the others are the Batak Pony, Bali Pony, Java Pony, Sumba and Sumbawa Pony (and closely related Sandalwood Pony), and Timor Pony.